Searching for Jazz Piano Lessons? Get Access To A Top Jazz Pianist In New York And Learn To Play Jazz Standards Using Sophisticated Jazz Chords. If You Can Read Music And Love Mainstream Jazz, You're Ready To Go! Have you often wondered what was the secret to those rich, modern-sounding jazz harmonies played by the hippest jazz pianists around? There's no better way to learn those reharmonization techniques than by having a great jazz pianist show you on the piano. The OBVIOUS WAY to do this is to take private lessons with your favourite pianist. But what if you don't live in New York? Or schedules are tricky? Or your finances are tight? Take online lessons! In fact, video lessons are BETTER than personal lessons because you can watch them over and over till you perfect the skill! What? There's already tons of stuff on YouTube? David Is One Of The World's Most Accomplished Jazz Pianists. He's also a member of the exciting "One For All" Sextet, with Eric Alexander, Jim Rotondi, Steve Davis, John Webber and Joe Farnsworth. David knows all the secrets of playing in the modern piano style. That's the style of Wynton Kelly, Bill Evans, Herbie Hancock, Cedar Walton, and many others. When you study jazz piano, there's only so much you can get from recordings or lead sheets. You will reach a point where you need mentoring. All jazz musicians have learned in this way, it's part of the great oral tradition of jazz. "Jazz Must Be Passed On Directly From Teacher To Student "
David has been committed to teaching for his entire career. That's why he put together this course: to share what he has learned during his 40 years of professional playing. He will SHOW YOU how to create modern and sophisticated jazz sounds. This course is designed to progress at a very steady pace, taking 21 weeks, and is expertly designed so that you will achieve impressive results by the end of the 21 lessons. 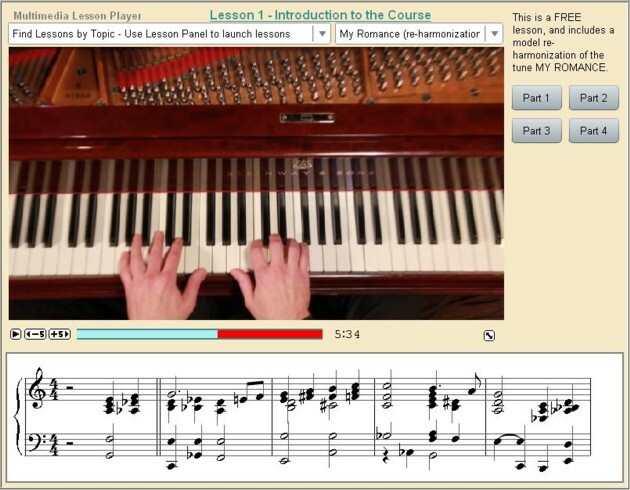 All the theory is explained with slides and practical examples on the piano. You will receive one lesson a week. There is a perfect mix of theory and practice. In fact, the course is based primarily on performance, and the theory will explain WHY you are performing certain things. David will show you exactly what to play, via a scrolling score and a top-down view of his hands. You can also download and print essential exercises. This will help you develop a strong link between the written notes and the hand positions on the piano. Almost each week you will get a powerful exercise that will put sophisticated jazz harmonies right into your fingers! These exercises provide the vocabulary for modern jazz harmonization. They will cover all 12 keys --- which is why you have at least 1 week to practice each exercise! "Your Piano Playing Will Undergo An Unbelievable Transformation "
David will explain the essential theory required to understand how he reharmonized each tune. While some of the terms may sound complicated, David will carefully explain the "mechanics" of the music both at the piano and with descriptive slides. Throughout the course, you will receive reminder emails and David's constant support and encouragement. Like any course, persistence and hard work will yield the desired results, but IT'S WELL WORTH IT! .....you may not be able to complete the course? Then commit to only the first 7 lessons, for JUST $49! If things go well, get the rest later. .....maybe the level is too high? Get the first lesson ABSOLUTELY FREE! If you can do Lesson 1, then the rest of the course will not be any harder! Guaranteed!! .....you won't be able to keep up? Once you have purchased the course, it will be available FOR EVER! You can go back to it when you have time. A. The lessons run on Windows and Macintosh. Furthermore, if you use the Puffin browser, you can view the videos on your iPad or Tablet. However, we don't recommend this, since the Multimedia Lesson Player is designed for at least an 800 x 600 screen. Q. "Can I hear some examples of the reharmonizations?" Q. "Okay - I am ready to get the course right now, and to start improving my playing.....what do I do?" "Hear What Other Clients Have Said"
"I was really attracted to the richness of the tune arrangements. After learning the first 2 songs, I already had a bunch ideas that I could put into all the other standards I like playing . This is definitely a top quality course!" "I really enjoyed the 15 exercises, they were a lot of work, but by the end of it, I felt like I could play any chord changes that were thrown my way! This course really gets you playing in a contemporary jazz style. Remember what we said at the beginning, about taking private lessons? Private lessons in New York are currently running at around $100, so 21 PRIVATE LESSONS would be $2,100. But if you sign up for all 21 LESSONS of David Hazeltine's ONLINE COURSE, you pay just over the price of ONE private lesson, that is... $148 ! However, I have even better news for you! We're running a promotion, and the price for all 21 lessons has been reduced to just $129! That's just $6 PER LESSON! But that's not all! If you sign up from this promotional page, we'll send you a free gift! 5 tunes from 5 of David's Albums ! You will be sent a link to the mp3 downloads after the purchase. I want to sign up for David Hazeltine's JAZZ PIANO MASTERY course, and take my piano playing to the next level! Yes! I will gain lifetime access to David's Jazz Piano Mastery course! Yes! I will practice diligently to improve my piano chops! Yes! I will receive the FREE GIFT of 5 tunes from David's albums! ORDER NOW from the JAZZ PIANO MASTERY website and get started on your way to become a JAZZ MASTER!